Amor: "Hong Kong comes alive for the sevens"
England head coach Simon Amor has plenty of experience as a player in Hong Kong and knows what it takes to win, having clinched four tournament titles. In 2002, England coach Simon Amor was studying for a degree in management studies at Cambridge University. When his head wasn't buried in books at the University Library, he was plying his trade as England sevens captain, travelling the world. Hong Kong was just one of those destinations worked into his academic calendar, a tournament soaked in history and prestige. "I grew up watching Hong Kong as a kid, it was always the big tournament to watch," said Amor. 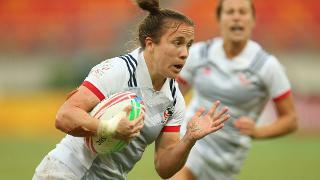 "The city comes alive when sevens arrives and everybody is focused on that one event on the series. It's a very special place to play." At the tournament in 2002, Amor found himself face-to-face with the great Waisale Serevi for the coin toss ahead of the Cup final. The Cambridge University website itself says that competent leadership comes with experience. You'll be hard pushed to find any experience that eclipses playing against Fiji in the final of your first ever Hong Kong Sevens. "It was a special one for me. The coin toss with Serevi, it was a surreal moment as he was a legendary player on the world series and a name everybody knew," he said. "I was captain of a team that had so many experienced players in it, with the likes of Henry Paul and Phil Greening, so to be leading them out was a real honour for me." England won the match 33-20, their first Hong Kong tournament win of four between 2002-06. Since Amor's time as a player, England haven't reached the heady heights of the top of the podium, finishing twice as runner-up in 2011 and 201414. 2017 might be their year, however. After six rounds on the HSBC World Rugby Sevens Series, England sit in second place on 103 points, 23 behind series leaders South Africa. The Blitzboks have been in imperious form so far on the series, but their kryptonite has been England. Amor's side are the only team to beat South Africa, three times so far this series, two of which were in Cup finals in Cape Town and Vancouver. "They are a ruthless team to play against but it brings out the best in our players," admitted Amor. "The team stands up to the challenge and you need to if you are to stand a chance of beating them. They are a side that punishes mistakes so you have to make sure you are on the top of your game. It's always a brilliant game of chess when England take on South Africa." One of England's key pieces on the board has been winger Dan Norton. The 29-year-old has scored six tries against South Africa, 34 in total on the 2016-17 series, and is the joint top try scorer of all-time with 244. "Dan's got a great ability to beat players and he is playing with real confidence," said Amor. "He will be the first to admit that it takes hard work from other players on the team to help give him the opportunities, but once he has them he is finishing them off. Dan has also worked on his defence a lot this year and is improving year-on-year in his all-around game. Safe to say he is playing a big role in the team." In Hong Kong England will face Australia, Samoa and South Korea in Pool A, three teams that will all provide their own unique challenges according to Amor. "Samoa are starting to move in the right direction and you can see what they are trying to do under Gordon Tietjens. They can prove to be a real handful so it's always a match you have to prepare for fully. "South Korea will be a different kind of game purely as they are a bit of an unknown quantity as we don't play them week in, week out. Australia have been doing great things under Andy Friend who has utilised some younger players in the first few rounds. They are bringing a bit more experience in for Hong Kong but once again it's going to be a very competitive pool and we know we'll have to play our best rugby to come out on top." Elsewhere, Olympic gold medallists Fiji find themselves in a pool with New Zealand, Wales and Japan. As reigning champions in Hong Kong for the past two years, and now under the tutelage of former Hong Kong sevens coach Gareth Baber, they are a team to be reckoned with. "The thing with Fiji is when they get it right, it's absolutely amazing to watch," he said. "You always know they are dangerous to play against as they play a different type of rugby to any other team on the series. In Hong Kong, we all know how much they like to play there. They will be all flare and skill, playing at their best."